'Climate services' can help by providing contextualised climate information such as forecasts and projections for use in decision-making. As recently as 20 years ago, climate services in developing countries were considered experimental and unreliable for making real-world decisions. 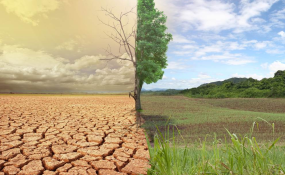 However, investments into climate research and model development has improved confidence in their outputs, which governments and non-governmental organisations (NGOs) are picking up on in efforts to increase community access to climate services. Better coordination is needed. The growing interest in climate services means that national services are being overstretched by an ever-expanding range of projects and partnerships. This can lead to duplication in services, conflicting information, and uneven levels of coverage. Initiatives like the World Meteorological Organization's Global Framework for Climate Services are calling for better coordination, but many countries simply can't keep up. NGOs may want to make sure their projects are in line with national priorities, but they ultimately remain accountable to bilateral donors in the North who have priorities of their own and expect to see timely project results. NGOs are expanding the reach of climate services, but communication is too one-directional. Research tells us that climate services are best when they're "co-produced," meaning that users help to define what the services are, and how they work. NGOs working in BRACED and elsewhere have made great advances in sharing information with communities who tend to be left out, using creative approaches like mobile phone messaging, theatre, and radio to reach them in formats they can access and understand. But more needs to be done to bring community knowledge into climate services. Many communities have long used local observations and traditional knowledge to anticipate climate trends, and disregarding their knowledge can lead to mistrust of new alternatives. NGOs can act as brokers to ensure that local voices and knowledge shape future investments and initiatives. Are we setting people up to fail? A final concern is around the long-term viability of these new developments. A large proportion of the advances in climate services have been financed through donor-funded projects that typically run for less than 5 years. These projects aim to get communities to use climate services regularly, with a view to changing people's decision-making behaviour for the long term. This may be fine while investment into climate services is high on the development agenda, but what will happen when projects end, donors move on to new priorities, and national services are left with insufficient resources to sustain the initiatives? News that an anticipated second phase of the BRACED programme will not proceed as planned illustrates this point. There are important ethical considerations at stake here, as communities are encouraged to base their planning around information sources that may not be around for the next farming season.